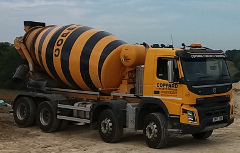 Readymix drum truck, batched offsite. 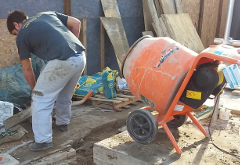 Mixing yourself, onsite with a cement mixer. I have listed these broadly in order of cost, except that the cheapest, drum trucks, can become the most expensive if you take small, part loads and take a long time to discharge. Volumetric trucks you find via Yellow Pages etc., don't come with the ability to mix in a chemical. Neither can they fine tune water or cement. Therefore they cannot produce waterproof concrete. 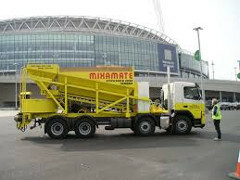 Mixamate have a number of depots and many of their trucks weigh batch concrete and mix it in a pan. They can add a plasticiser and make waterproof concrete. 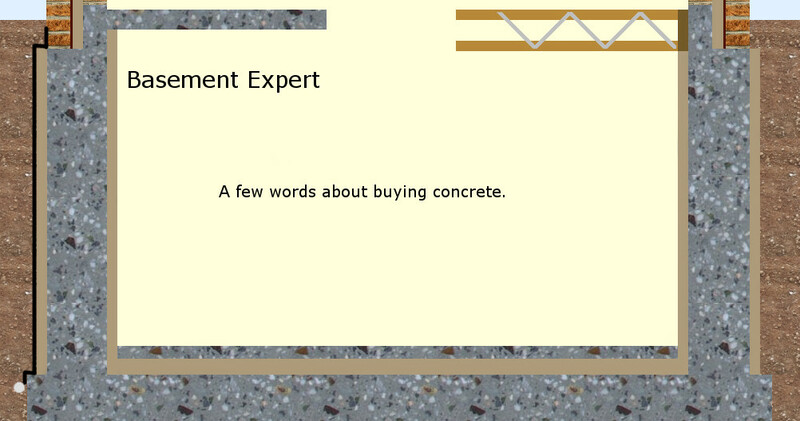 * see note below about buying any site-mixed concrete. 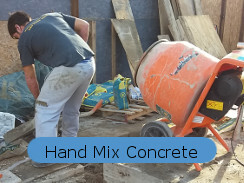 I have another page about mixing waterproof concrete by hand here. 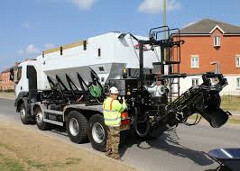 Most onsite concrete producers have been carrying only ballast on their trucks. Until September 1st 2018 they were plant, not HGVs. This meant they had no weight restriction. Ballast is dug from the ground and has the clay washed out. This means it is no longer a dense mixture. A cubic metre of ballast weighs considerably less than a cubic metre of combined stone aggregate and sharp sand. All the onsite producers discovered that by filling both bins with ballast (instead of one with stone aggregate and the other with sharp sand) that they could produce up to 12 cubic metres per trip, fully loaded, instead of only 9 cubic metres, loaded to the limit of an HGV. But from September 1st 2018 they are HGVs, not plant. They can no longer use red diesel, the driver needs a proper HGV licence and not a car licence and their weight is restricted. Whether this means some will carry stone and sand and blend them together to make decent concrete only time will tell. 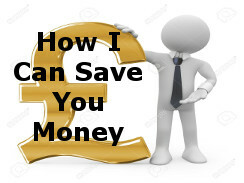 You should check so you know what you will buy. Either way, onsite concrete producers cannot produce reliable waterproof concrete. 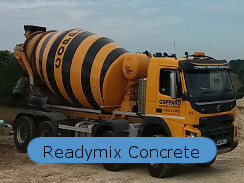 Readymix drum trucks would usually be expected to mix the best quality concrete because they blend sharp sand and larger aggregate as well as weigh batch everything they produce.